Every year I have intended to share the recipe for a sweet potato & carrot purée that has been a staple on our fall and winter table for longer than I can remember. The original version is from Julee Rosso & Sheila Lukins first collaborative cookbook, The Silver Palate Cookbook. I have altered it only slightly. 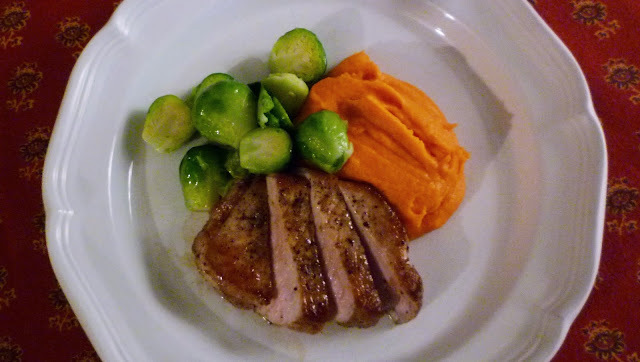 If you have a food processor, it is easy very easy to make...and delicious with all kinds of fall and winter preparations, from weeknight steaks/chops/cutlets, to weekend roasts or braises/stews. In short, perfect for almost any occasion...from casual to elegant. Two things will insure success with this dish: choosing the right kind of sweet potato...and cooking the carrots properly. When you purchase your sweet potatoes, look for the moist-fleshed, "yam"-type varieties. Nationally this will probably be those labeled "Louisiana", Jewel or Garnet. In the Midwest (where I live), local growers almost without exception grow a wonderful variety known as Beauregard. All of these varieties have high residual sugar (particularly if they have been cured properly) and are low starch (which is one of the reasons they can be puréed in the food processor without becoming gluey like a white potato). Cooking the carrots involves a simple two step process. 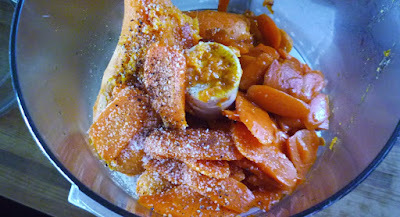 First, the carrots are boiled (covered) until they are very tender (but not falling apart) in a small amount of water enhanced with sugar and butter. Once tender, they are uncovered and the heat is increased so that the water can be boiled away. 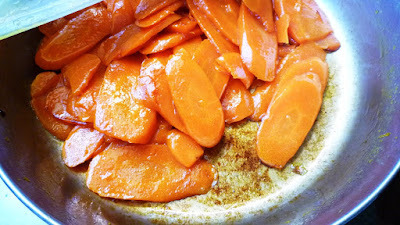 The carrots are finished when the water is gone, the sugar has begun to caramelize in the pan and the carrots are sizzling in the butter. If the carrots are not properly cooked—that is, if they are either not soft enough, or there is water left in the pan—there will be a couple of problems. First, there will likely be chunks of carrot in the purée. As long as they are tender, this isn't the end of the world...but the purée will not be as suave and elegant as it is when perfectly smooth. 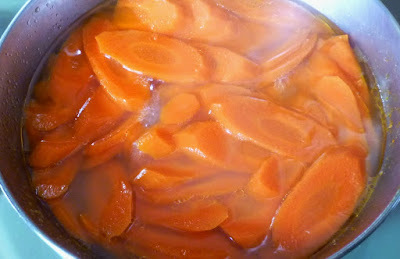 Secondly, if there is water left, the carrots will not only be water-logged, they will not have been able to caramelize. Both of these things result in a less concentrated flavor. 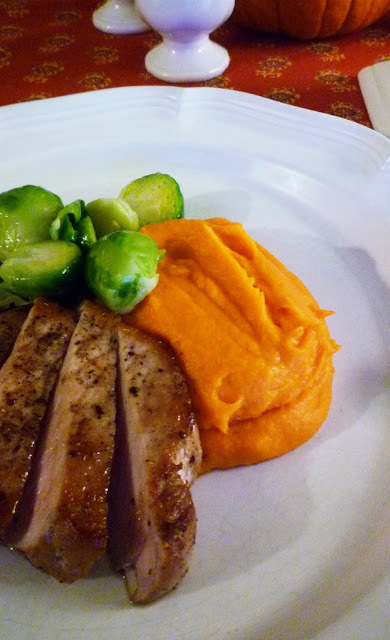 Furthermore, if the excess water is added along with the carrots to the sweet potatoes, the purée will be too soft and won't be able to hold very much butter or cream....both of which add a great deal to the final texture and taste. I love everything about this purée. It is easy to prepare and requires very little attention during the cooking process...which allows me to focus on other, more involved, preparations. And, it reheats beautifully...making it perfect for a holiday gathering. Its sweet flavor profile makes a perfect companion for the slightly bitter green vegetables of winter: Brussels sprouts, broccoli, kale and chard. Best of all, everyone loves it. People who like their sweet potatoes to be sweet are happy...as are those that think sweet potatoes are already sweet enough on their own. 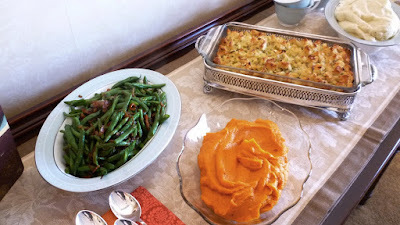 I hope you will try it...and that it becomes a fall and winter staple on your table too. Prick the sweet potatoes in several spots with a fork or paring knife and transfer to a baking sheet. Bake in a 375° to 400° oven, until easily pierced with the tip of a knife and the natural sugars have begun to ooze a bit—about 40 to 60 minutes. While the sweet potatoes are roasting, place the carrots in a wide, shallow saucepan and add the sugar, 2 T. of butter and a pinch of salt. Add water to almost cover the carrots. Cover the pan and bring to a boil. Reduce the heat and cook the carrots (covered) at a rapid simmer until they are very tender—about 20 to 25 minutes. Uncover, increase the heat to medium high and boil until the liquid has reduced to a glaze, the sugar begins to caramelize and the carrots are sizzling in the butter—watch carefully when the liquid has evaporated, shaking the pan back and forth to coat the carrots in the buttery glaze. When the sweet potatoes are finished baking, cut them open and scoop out the flesh. Transfer to the food processor along with the carrots and purée until very smooth. Season to taste with salt, pepper and nutmeg. Add butter and process in. Add heavy cream to obtain the consistency you prefer by adding it through the feed tube with the processor running. Keep warm until ready to serve. Serves 6 to 8. 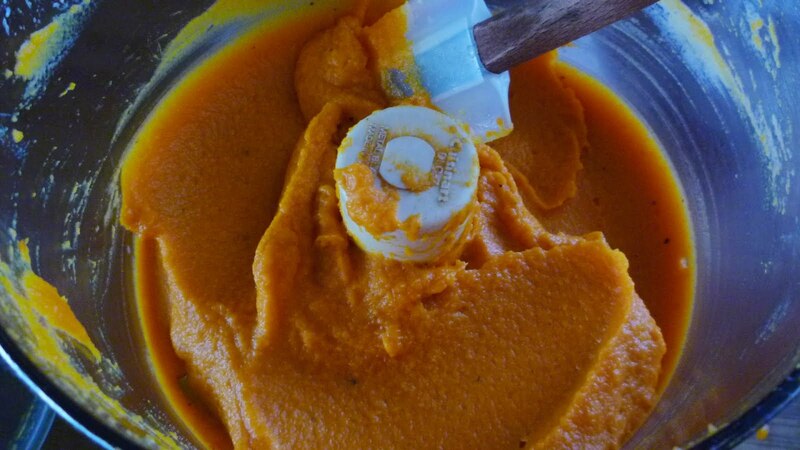 Note: If you are working ahead, cool the sweet potato-carrot purée and store covered in the refrigerator. Bring to room temperature before reheating. The purée may be reheated in a stainless steel bowl, set over simmering water (stir occasionally with a heatproof rubber spatula as the purée heats) or in the microwave. When hot, taste and correct the seasoning and add more butter or cream if necessary.